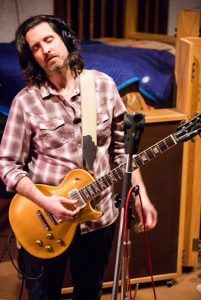 Scott Sharrard, the musical director and lead guitarist for the Gregg Allman Band, is taking his solo band back on the road. Scott and his Brickyard Band feature a unique blend of rock, blues, soul and all the musical influences that have made the performances by Scott and his band a staple within the New York Club scene. Sharrard’s live performances have also captured the attention of summer festival crowds, making the Brickyard Band a favorite at venues like the Peach Festival. Scott and the Brickyard Band recently completed a successful tour of the Southeast — highlighted by an appearance Macon, Ga., where Scott played Duane Allman’s legendary 1957 Les Paul Gold Top guitar. In mid-October, Scott led the Gregg Allman Band – reunited for the first time in nearly a year – for a special appearance during the Laid Back Festival in Atlanta. Gregg’s touring band, which backed the music legend on the recording of Southern Blood at FAME Studio’s in Muscle Shoals, was joined on stage by Devon Allman, Gregg’s son. The set featured several memorable performances, celebrating Gregg’s music and Southern Blood, an album that reached No. 1 on Billboard’s Americana charts. My Only True Friend, the lead track from Southern Blood, was co-written by Scott and Gregg. Southern Blood also included another original composition by Scott, as Gregg and the band recorded a studio version of Love Like Kerosene. Scott spent considerable time in September and October making appearances in support of Southern Blood’s release. As noted in the headline, Scott will be available for interviews during the time ahead of the Brickyard Band’s upcoming appearance. We will be glad to work with digital, print, radio and TV outlets to schedule interview time with Scott. From beginning his career in the Midwest and learning from legends like Hubert Sumlin to serving as Gregg Allman’s chief lieutenant for a decade, Scott’s held a front-row seat with some of the true greats in music. Interviewers find Q&A’s with Scott to be highly insightful and from the heart. If you would like to set up an interview with Scott or learn more about the upcoming appearance, please contact us by clicking here. Scott’s Q&A with One Way Out author and Allman Brothers historian Alan Paul — click here. Rolling Stone Magazine goes inside the recording session for Southern Blood with producer Don Was, Scott and others — click here. Billboard Magazine’s look inside Southern Blood with observations from Don Was and Scott — click here. Newsweek’s review of Southern Blood — click here. Local TV report on Scott’s October appearance Macon, featuring interview with Scott — click here. Scott’s official website — click here. Scott’s PledgeMusic.com page for his upcoming album Saving Grace — click here. Feature story and podcast series highlighting Scott’s recording sessions for his upcoming solo album — click here. Scott and the Brickyard Band’s Facebook Page — click here.